One of the so-called minor prophetical books of the Old Testament. It contains four addresses. The first (i. 2-11), dated the first day of the sixth month of the second year of Darius Hystaspes (520 B.C. ), described as directed against, or to, Zerubbabel the governor and Joshua the high priest (i. 1), is designed to arouse the people from their indifference to the rebuilding of the Temple, an indifference in glaring contrast to the care taken to secure comfortable and well-appointed private dwellings (i. 4); drought and dearth are announced as a penalty (i. 5-6, 10-11). Their failure to rebuild the Temple is the cause of their disappointment (i. 9). This brief discourse has the desired effect (i. 12). Haggai announces that Yhwh is with them. In the twenty-fourth day of the sixth month (520) work on the Temple begins. The second address is dated the twenty-first day of the seventh month, and strikes the note of encouragement. It seems that many had again become despondent; the prophet assures these that God's spirit, in accordance with the covenant made at the time of the exodus from Egypt, is with them. Yet a little while, and Yhwh's power will become manifest. All the nations will bring tribute to make this house glorious. What the nations now call their own is in fact Yhwh's. Thus the glory of the later house will be greater than that of the earlier, which so many despair of equaling. Peace will reign in the Second Temple (ii. 1-9). The third discourse is dated the twenty-fourth day of the ninth month of Darius. It is prefaced by questions addressed to the priests concerning certain applications of the law of Levitical purity. The answers of the priests to his questions furnish the text for his exposition of the people's sin in not erecting the Temple. These shortcomings are the reason for the dearth. Their removal, therefore, will bring Yhwh's blessing (ii. 10-19). 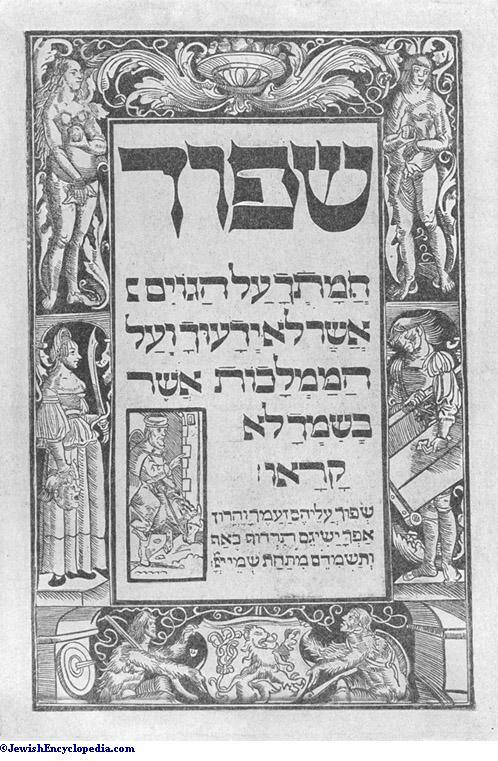 Page from the First Illustrated Printed Haggadah, Prague, 1526. On the same day (the twenty-fourth of the ninth month) Haggai addresses another (the fourth) discourse to Zerubbabel, announcing Yhwh's determination to bring to pass great political upheavals, resulting in the dethroning of kings and the defeating of their armies. In consequence of these wonderful reversals of the prevailing political conditions, Zerubbabel will become the "signet" as the one chosen of Yhwh; that is, Zerubbabel will be crowned as the independent (Messianic) king of independent Judea (ii. 20-23). Contrasted with the flow and fervor of the utterances of other prophets, Haggai's style certainly justifies the rabbinical observation that he marks the period of decline in prophecy (Yoma 9b). He scarcely ever rises above the level of good prose. The critics have found in this a confirmation of the assumption that Haggai wrote and spoke only after having reached a very ripe old age. Certain turns of phraseology are characteristically affected by him: (i. 5, 7; ii. 15, 18a, b); = "and now," introducing an appeal (i. 5; ii. 4, 15). Repetitions of words are frequent: (i. 7, 8); [ (ii. 4a, b, c, 6, 7, 8a, b, 14, 17, 23a, b, c); (ii. 22, twice); (ii. 4, thrice). Haggai loves to recall in one final word the preceding idea: i. 2b, 12b; ii. 5b ( ), 19b ( ). The text is in good condition, and the versions do not exhibit important variants. The Septuagint has additions in ii. 10-15, and several omissions, one (ii. 5) very extensive. "Be-mal'akut" (i. 13) is represented by έν ἀγγέλοις = "be-mal'ake." The Peshiṭta presents the reading "ḥereb" (sword) for "ḥoreb" (drought) in i. 11, and the "hif'il" instead of the "ḳal" in "u-ba'u"—(ii. 7; comp. L. Reinke, "Der Prophet Haggai," pp. 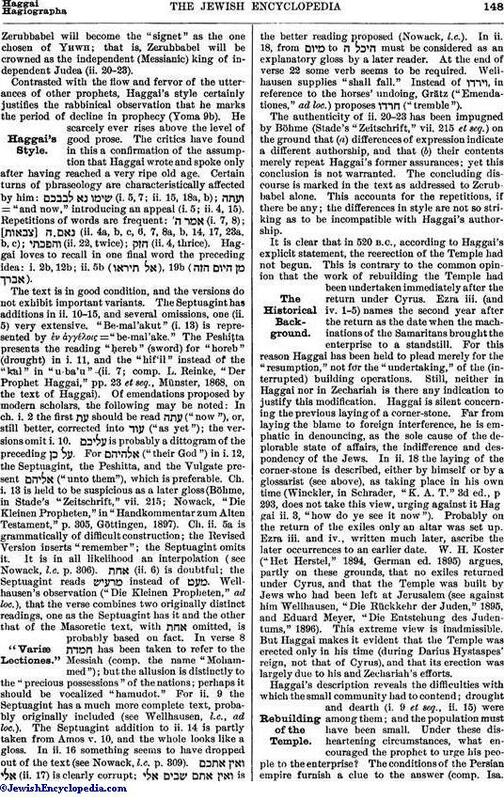 23 et seq., Münster, 1868, on the text of Haggai). Of emendations proposed by modern scholars, the following may be noted: In ch. i. 2 the first should be read ("now"), or, still better, corrected into ("as yet"); the versions omit i. 10. is probably a dittogram of the preceding . For ("their God") in i. 12, the Septuagint, the Peshiṭta, and the Vulgate present ("unto them"), which is preferable. Ch. i. 13 is held to be suspicious as a later gloss (Böhme, in Stade's "Zeitschrift," vii. 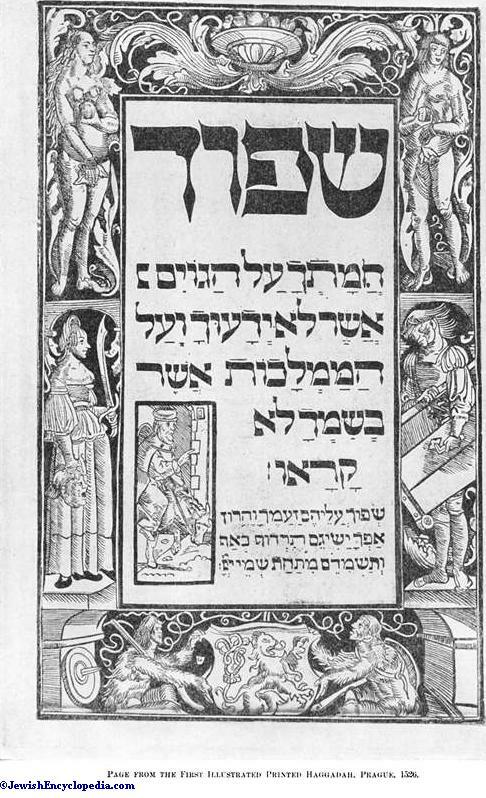 215; Nowack, "Die Kleinen Propheten," in "Handkommentar zum Alten Testament," p. 305, Göttingen, 1897). Ch. ii. 5a is grammatically of difficult construction; the Revised Version inserts "remember"; the Septuagint omits it. It is in all likelihood an interpolation (see Nowack, l.c. p. 306). (ii. 6) is doubtful; the Septuagint reads instead of . Wellhausen's observation ("Die Kleinen Propheten," ad loc. ), that the verse combines two originally distinct readings, one as the Septuagint has it and the other that of the Masoretic text, with omitted, is probably based on fact. In verse 8 has been taken to refer to the Messiah (comp. the name "Mohammed"); but the allusion is distinctly to the "precious possessions" of the nations; perhaps it should be vocalized "ḥamudot." For ii. 9 the Septuagint has a much more complete text, probably originally included (see Wellhausen, l.c., ad loc.). The Septuagint addition to ii. 14 is partly taken from Amos v. 10, and the whole looks like a gloss. In ii. 16 something seems to have dropped out of the text (see Nowack, l.c. p. 309). (ii. 17) is clearly corrupt; is the better reading proposed (Nowack, l.c.). In ii. 18, from to must be considered as an explanatory gloss by a later reader. At the end of verse 22 some verb seems to be required. Wellhausen supplies "shall fall." Instead of , in reference to the horses' undoing, Grätz ("Emendationes," ad loc.) proposes ("tremble"). The authenticity of ii. 20-23 has been impugned by Böhme (Stade's "Zeitschrift," vii. 215 et seq.) on the ground that (a) differences of expression indicate a different authorship, and that (b) their contents merely repeat Haggai's former assurances; yet this conclusion is not warranted. The concluding discourse is marked in the text as addressed to Zerubbabel alone. This accounts for the repetitions, if there be any; the differences in style are not so striking as to be incompatible with Haggai's authorship. It is clear that in 520 B.C., according to Haggai's explicit statement, the reerection of the Temple had not begun. This is contrary to the common opinion that the work of rebuilding the Temple had been undertaken immediately after the return under Cyrus. Ezra iii. (and iv. 1-5) names the second year after the return as the date when the machinations of the Samaritans brought the enterprise to a standstill. For this reason Haggai has been held to plead merely for the "resumption," not for the "undertaking," of the (interrupted) building operations. Still, neither in Haggai nor in Zechariah is there any indication to justify this modification. Haggai is silent concerning the previous laying of a corner-stone. Far from laying the blame to foreign interference, he is emphatic in denouncing, as the sole cause of the deplorable state of affairs, the indifference and despondency of the Jews. In ii. 18 the laying of the corner-stone is described, either by himself or by a glossarist (see above), as taking place in his own time (Winckler, in Schrader, "K. A. T." 3d ed., p. 293, does not take this view, urging against it Haggai ii. 3, "how do ye see it now"). Probably on the return of the exiles only an altar was set up. Ezra iii. and iv., written much later, ascribe the later occurrences to an earlier date. W. H. Koster ("Het Herstel," 1894, German ed. 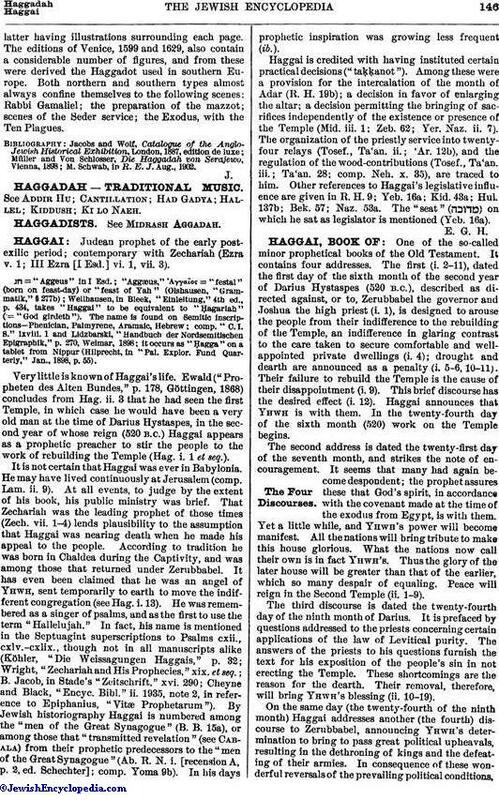 1895) argues, partly on these grounds, that no exiles returned under Cyrus, and that the Temple was built by Jews who had been left at Jerusalem (see against him Wellhausen, "Die Rückkehr der Juden," 1895, and Eduard Meyer, "Die Entstehung des Judentums," 1896). This extreme view is inadmissible. 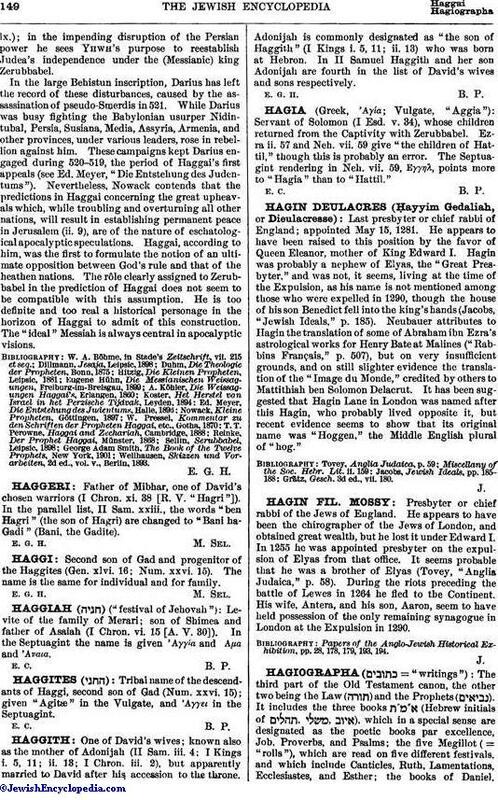 But Haggai makes it evident that the Temple was erected only in his time (during Darius Hystaspes' reign, not that of Cyrus), and that its erection was largely due to his and Zechariah's efforts. Haggai's description reveals the difficulties with which the small community had to contend; drought and dearth (i. 9 et seq., ii. 15) were among them; and the population must have been small. Under these disheartening circumstances, what encouraged the prophet to urge his people to the enterprise? The conditions of the Persian empire furnish a clue to the answer (comp. Isa.lx. ); in the impending disruption of the Persian power he sees Yhwh's purpose to reestablish Judea's independence under the (Messianic) king Zerubbabel. In the large Behistun inscription, Darius has left the record of these disturbances, caused by the assassination of pseudo-Smerdis in 521. While Darius was busy fighting the Babylonian usurper Nidintubal, Persia, Susiana, Media, Assyria, Armenia, and other provinces, under various leaders, rose in rebellion against him. These campaigns kept Darius engaged during 520-519, the period of Haggai's first appeals (see Ed. Meyer, "Die Entstehung des Judentums"). Nevertheless, Nowack contends that the predictions in Haggai concerning the great upheavals which, while troubling and overturning all other nations, will result in establishing permanent peace in Jerusalem (ii. 9), are of the nature of eschatological apocalyptic speculations. Haggai, according to him, was the first to formulate the notion of an ultimate opposition between God's rule and that of the heathen nations. The rôle clearly assigned to Zerubbabel in the prediction of Haggai does not seem to be compatible with this assumption. He is too definite and too real a historical personage in the horizon of Haggai to admit of this construction. The "ideal" Messiah is always central in apocalyptic visions. Wellhausen, Skizzen und Vorarbeiten, 2d ed., vol. v., Berlin, 1893.